i-tab Billed As World's First Electronic Songbook | OhGizmo! Neck Traction Designed To Relieve Neck Pain – Looks Comfortable To Me! 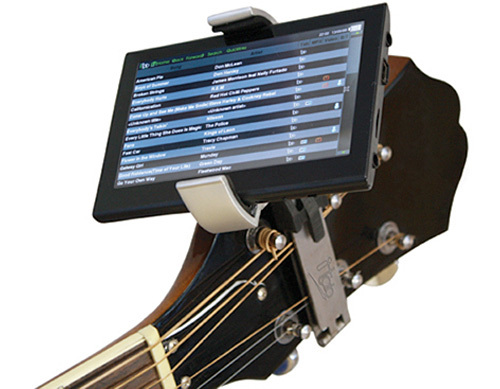 Designed to clip on the headstock of any guitar, the i-tab is a 5-inch touchscreen device that displays and scrolls chords and lyrics in perfect time, serving as a sort of musical teleprompter for guitar players. 4GB of built-in storage provides enough space to carry around thousands of tabs, which are conveniently available for sale and download from the i-tab online Tab Store. At launch the store is expected to have around 5,000 tabs available, with roughly 500 new tabs being added on a weekly basis. The 0.14kg device also has a built-in speaker, headphone port, stylus, USB connection and even video out for connecting it to a TV allowing everyone to sing along. i-tab comes with 30 free tabs to get you started including songs from U2, Oasis and The Rolling Stones, and is expected to be available in April for $199. Seems like a clever enough idea, though I can’t help but feel the same thing could have been accomplished with a custom iPhone app and case. That's pretty cool. I wonder if it would help beginners learn the guitar.